Pesto with Tomato, Basil and “Aceto Balsamico di Modena PGI” (Balsamic Vinegar of Modena). A delicious combination of tasty tomatoes, Modena IGP Balsamic Vinegar and PDO Grana Padano. A pesto that envelopes the love for simple and decisive flavours. Made without any added preservatives, always ready for pasta to discover the richness of Mediterranean flavours. 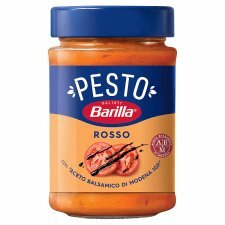 Pesto Rosso Barilla is ideal with Fusilli and is ready to put directly on pasta that has just been drained. To enjoy it at its best, Barilla suggests using a little of the pasta cooking water to dilute the Pesto and always stir the Pesto through your pasta away from direct heat. Once opened keep refrigerated and use within 5 days.